With attention riveted on the new scam that the Italian prosecutors have unearthed for Indian opposition, a brewing confrontation in Patna between Chief Minister Nitish Kumar and Governor Devanand Konwar is not receiving the focus it deserves. What is happening in the Bihar capital is a replay of Kumudben Joshi show the readers may be familiar with. Like the Congress Minister hoisted on NTR’s Telugu Desam as the eyes and ears of the centre in Hyderabad Raj Bhavan years ago, the former Assam lawmaker in Patna Raj Bhavan is putting his own spin on ‘due process of consultation’. The governors in Gandhinagar and Kolkata are also said to be in the same league. Old time politician Konigeti Rosaiah appears to be an exception and this is clear from the rapport he enjoys with Chief Minister Jayalalithaa. While on the subject of old time politicians, pertinent to remember is that Balaram Jakkhar had a smooth sail in Bhopal’s Raj Bhavan to the dismay of his Congress friends in the state. 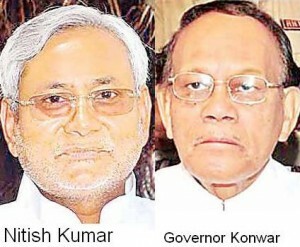 Governor Konwar kicked up a row by appointing six vice-chancellors and four pro-vice chancellors without taking Nitish Kumar on board. His contention is a recap of Kumudben Joshi’s case. The Universities Act under which these appointments are made gives Raj Bhavan a free hand, and yet the state government was consulted, according to his office. 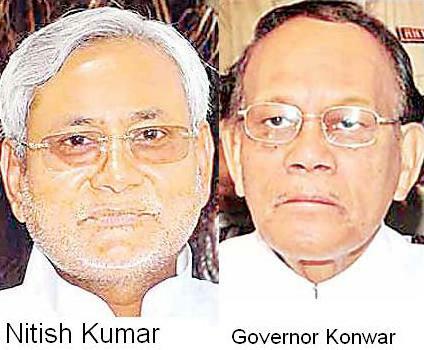 The Patna High Court has ruled in favour of the Governor when the Chief Minister knocked at its doors last December. The court said that Raj Bhavan could, in fact, over rule the choice of the government which should be consulted nevertheless. This is what the governor did on Saturday, Feb 9 and issued a notification reappointing his original choice. Did Governor Konwar consult his government? He did not, according to Nitish, who, as media reports from Patna point out, generally avoids a confrontation with Raj Bhavan. “If the Governor’s office writing a letter to the government (on VC appointments) is consultation, it was done. But it was not consultation in true sense of the term”, says the chief minister. Nitish case is simple. The governor cannot usurp the role of a chief minister, who is accountable to the people for all the actions of the government. Years ago, NTR raised the same question. In recent months, Narendra Modi articulated the same question though in the context of appointment of a Lokayukta. There were few takers for the Modi plea. The Congress and the Governor took the high moral ground and charged him with plans to either pick up a pliable judge or keep the post vacant. There may be merit in Modi’s case against his governor and in Nitish’s clash with Patna Raj Bhavan. But that is not the issue at stake. Also not at stake is the law as it stands today in matters of appointing a VC or a Lokayukta. These laws belong to the period when same party ruled from Delhi and the state capitals and therefore didn’t envisage friction between the CMO and Raj Bhavan. So in the changed times, the issue is how a governor should function? Is he (or she) a friend, philosopher and guide of the chief minister or super chief minister playing to the galleries? The Congress refuses to entertain these questions. Though it styles itself as the Grand Old Party (GOP) and claims ‘Good Governance’ as its USP, the party has not learnt the basics of running its machinery outside the national capital. The appointments made to Raj Bhavans by UPA-I and UPA-II clearly show that the party is banking on the faithful in a gubernatorial post to accomplish for it which it is unable to achieve in the normal course. Right from the Nehru era, it has been turning to the man in the golden cage, as a former governor once described Raj Bhavan, to engineer a majority or to rescue the incumbent chief minister from dissidents. The country has seen many Ram Lals, who have done a better job than the good old Himachal Congressman, whose hatchet job had given fresh lease to Thespian NTR. These days superannuated policemen manning the Raj Bhavan appear to be in a hurry to do one-up on the Ram Lals of yore. Their brief is visible in the background briefings. For instance, when a policeman was sent to Chattisgarh, it was said his expertise in intelligence gathering and policing would be useful to tackle the Naxalite menace. Implicit is the message that the gentleman would have a say in the anti-Naxal policy. The state was rued at that time, as now, by the Bharatiya Janata Party (BJP). Chief Minister Raman Singh has been quietly delivering the votes to his party with impressive record on development front. Put mildly, the buck stops at the Raman Singh’s door since he has to face the test of accountability. So, should the governor override him? This is the very question that Nitish Kumar has kicked up in Bihar. And Mamata Bannerjee appears to do so in Kolkata, where the incumbent in Raj Bhavan, Mayankote Kelath Narayanan, has reacted angrily in public after ‘Didi’ shunted out the top cop of the ‘city of joy’. The Chief Minister may have acted in haste and made the police commissioner the scapegoat for the political fall-out of the death of a sub-inspector, as most reports put it. But was it fair and proper for the governor to react in the way Narayanan did. “If it (transfer of CP) might have to do with what happened in the last few days, clearly there is something that is wrong and we will have to look into it”, he was quoted as saying. Who are this ‘we’ the governor was referring to? He offered no direct reply but left no doubts when he said “I presume they (Mamata government) should answer whether they are capable of running a government or not. The governor cannot answer that, he can only act”.